This is a story about darkness and light, about sorrow and joy, about something lost and something found. This is a story about Love. Cinderella's story has been told over and over, but never has it been touched by the kind of magic found in this book. Mary Blair painted the original pictures for Walt Disney's incomparable animated film, and here her elegant art is gathere This is a story about darkness and light, about sorrow and joy, about something lost and something found. This is a story about Love. Cinderella's story has been told over and over, but never has it been touched by the kind of magic found in this book. 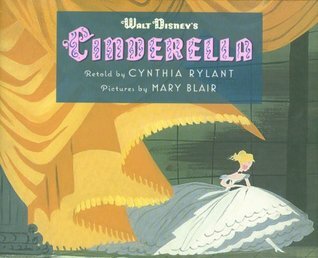 Mary Blair painted the original pictures for Walt Disney's incomparable animated film, and here her elegant art is gathered together as a picture book for the first time. Cynthia Rylant's stories about hardscrabble lives have won not only awards and honors, but hearts. Who better to take a young girl from the darkness of her garret room to the light and brilliance of a ballroom? Together these two great artists have created something quite astonishing: a Cinderella that is breathtaking, heartrending, and joyous, both for those who are coming to the tale for the very first time, and for those who think they know it well.